Parenteral vitamin D is associated with improved survival among long-term hemodialysis patients. Among nondialyzed patients with chronic kidney disease (CKD), oral activated vitamin D reduces parathyroid hormone levels, but the impact on clinical outcomes is unknown. We evaluated associations of oral calcitriol use with mortality and dialysis dependence in 1418 nondialysis patients with CKD and hyperparathyroidism in the Veterans’ Affairs Consumer Health Information and Performance Sets database. Incident calcitriol users and nonusers were selected on the basis of stages 3 to 4 CKD, hyperparathyroidism, and the absence of hypercalcemia before calcitriol use and then were matched by age and estimated kidney function. During a median follow-up of 1.9 yr, 408 (29%) patients died and 217 (16%) initiated long-term dialysis. After adjustment for demographics; comorbidities; estimated kidney function; medications; and baseline levels of parathyroid hormone, calcium, and phosphorous, oral calcitriol use was associated with a 26% lower risk for death (95% confidence interval 5 to 42% lower; P = 0.016) and a 20% lower risk for death or dialysis (95% confidence interval 1 to 35% lower; P = 0.038). The association of calcitriol with improved survival was not statistically different across baseline parathyroid hormone levels. Calcitriol use was associated with a greater risk for hypercalcemia. In conclusion, oral calcitriol use is associated with lower mortality in nondialysis patients with CKD. A body of evidence suggests potential health benefits of vitamin D beyond reducing PTH levels.12 Activated vitamin D binds to the vitamin D receptor to influence a diverse genetic response.13 In renal and nonrenal populations, lower 25-hydroxyvitamin D and 1,25-dihydroxyvitamin D levels have been associated with cardiovascular risk factors, including higher renin levels, inflammation, albuminuria, and glucose intolerance.14–17 In observational studies of long-term hemodialysis patients, intravenous vitamin D treatment has been associated with improved survival.18–21 Given biologic plausibility for an effect of oral calcitriol on survival and lack of clinical outcome data pertaining to this commonly prescribed CKD medication, we evaluated associations of oral calcitriol use with mortality and dialysis dependence in 1418 patients with stages 3 to 4 CKD and hyperparathyroidism. Calcitriol users and matched control patients were generally older, male, with >50% prevalent diabetes (Table 1). Median estimated GFR (eGFR) was 29 ml/min per 1.73 m2; 48% of study patients had stage 3 CKD, and 52% had stage 4 CKD. Compared with matched control subjects, calcitriol users had higher serum PTH levels, modestly lower eGFR, more nephrology clinic visits, and a slightly greater prevalence of comorbid conditions. Other laboratory measurements and markers of health care use were similar. Median follow-up was 1.9 yr (interquartile range [IQR] 0.8 to 3.5 yr). During the study period, 12 (3%) calcitriol users and 40 (4%) control patients were lost to follow-up. There were 109 deaths among calcitriol users and 299 deaths among nonusers. Unadjusted mortality rates were 12.8 events per 100 person-years in the calcitriol group and 18.3 events per 100 person-years in the control group. Mortality rates were consistently lower comparing calcitriol users with nonusers within subgroups defined by age, diabetes, eGFR, and baseline PTH levels (Table 2). During follow-up, 75 calcitriol users and 142 nonusers initiated long-term dialysis (10.4 events per 100 person-years and 10.1 events per 100 person years among calcitriol users and nonusers, respectively). Cumulative incidence rates of mortality and mortality plus dialysis dependence remained lower among calcitriol users compared with nonusers throughout follow-up (Figure 1). Some convergence in incidence estimates for the combined end point was noted after 2 yr of follow-up; however, the number of study patients who were followed for >2 yr without either event was relatively small. 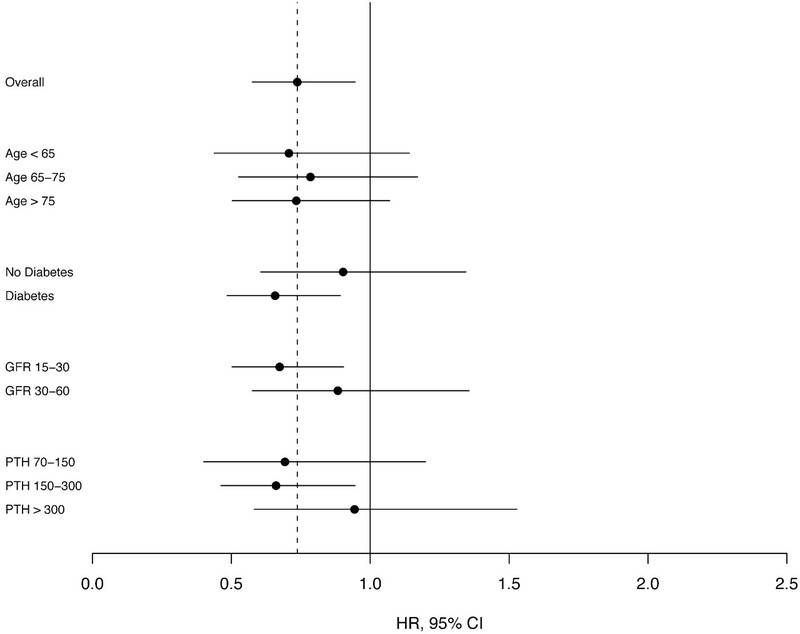 Cumulative incidence of mortality and mortality plus dialysis among the study cohort. After adjustment for age, race, and gender, calcitriol use was associated with a 24% lower (95% confidence interval [CI] 40 to 5% lower) hazard of death and a 14% lower (95% CI 29% lower to 4% higher) hazard of death or long-term dialysis. Further adjustment for comorbid conditions, eGFR, and baseline PTH level modestly increased the strength of observed associations (Table 3); additional adjustment did not appreciably alter the hazard ratios. Fully adjusted associations of calcitriol with mortality for starting calcitriol dosages of <0.25 and 0.25 μg/d were 0.68 (95% CI 0.47 to 0.98) and 0.78 (95% CI 0.58 to 1.05), respectively. Associations were modestly stronger among patients with lower baseline serum PTH levels, those with diabetes, and those with lower baseline GFR; however, none of these contrasts was statistically significant (Figure 2). 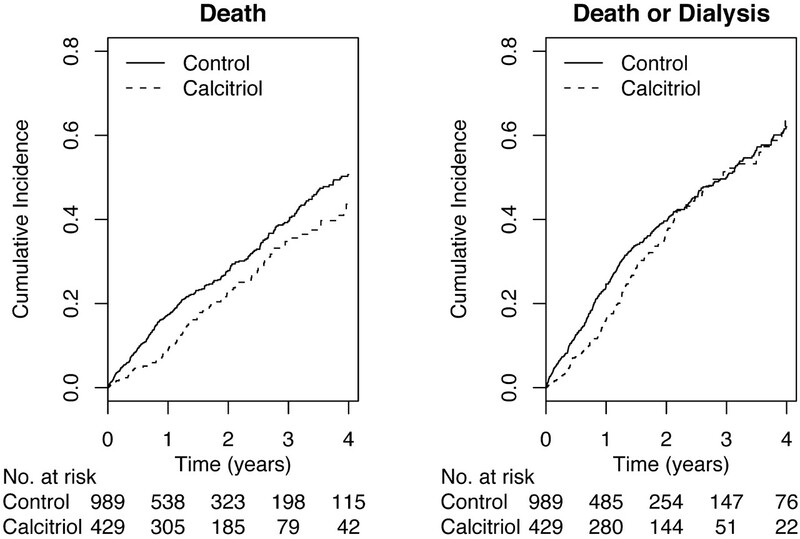 Hazard ratio for mortality, comparing calcitriol uses with nonusers, among subgroups. Results are stratified by site and adjusted for age, gender, race, eGFR, diabetes, coronary heart disease, Charlson comorbidity index; use of angiotensin-converting enzyme inhibitor, angiotensin II receptor blocker, statin, erythropoietin, and oral calcium; body mass index; systolic BP; serum levels of albumin, calcium, PTH, and phosphate; and number of nephrology clinic visits in the previous year (model 3). Median calcitriol adherence was estimated to be 85% (IQR 51 to 100%). A total of 161 (17%) control patients initiated oral calcitriol at a median of 285 d (IQR 113 to 598 d) after study start. Associations of calcitriol with outcomes were similar using an as-treated analysis, in which nonusers who initiated calcitriol during follow-up were censored on the date of first calcitriol use (Table 3). Among calcitriol users with available follow-up measurements, mean serum calcium and phosphate levels increased, and mean serum PTH levels decreased, after 6 mo, 1 yr, and 2 yr of follow-up (Figure 3). Hypercalcemia was observed in 63 (15%) calcitriol users and 106 (11%) nonusers among patients with follow-up measurements. In the intention-to-treat model, calcitriol was associated with a 4% greater adjusted hazard for hypercalcemia (95% CI 30% lower to 55% higher). In the “as-treated” model that censored control patients who initiated calcitriol during follow-up, calcitriol was associated with a 52% greater risk for hypercalcemia (95% CI 3% lower to 137% higher). Changes in mean serum PTH, calcium, and phosphate levels during follow-up. Each 25-pg/ml increase in PTH levels was associated with a statistically significant 3% greater mortality risk (95% CI 1 to 5% greater risk) in the fully adjusted model. To explore whether changes in PTH levels might partially account for the observed protective association of calcitriol, we examined associations before and after adjustment for follow-up PTH levels. Adjustment for PTH as a time-varying covariate did not appreciably alter the strength of the association of calcitriol with mortality (adjusted hazard ratio 0.82; 95% CI 0.64 to 1.03). We observed an association of oral calcitriol with lower mortality among adults with stages 3 to 4 CKD and hyperparathyroidism, independent of measured comorbidity, kidney function, and serum PTH levels. Associations were statistically similar according to baseline PTH level, eGFR, and diabetes status, although stratified analyses were limited by sample size. These are among the first data to describe clinical outcomes associated with oral activated vitamin D agents in nondialysis patients with CKD. There is biologic plausibility for an association of calcitriol use with lower mortality. Vitamin D is a pleiotropic steroid hormone that binds to its intracellular receptor to elicit a diverse genetic response.12 Experimental and epidemiologic studies have connected lower 25-hydroxyvitamin D and 1,25-dihydroxyvitamin D levels with cardiovascular risk factors, including increased renin activity, hypertension, inflammation, insulin resistance, diabetes, and albuminuria.14,22–24 Calcitriol blocks renin expression through interaction of the vitamin D receptor with response elements located in the promoter region of the renin gene, and calcitriol decreases expression of IL-1, -2, and -6 and TNF-α by macrophages and activated T cells.14,15,23 Lower serum 25-hydroxyvitamin D levels have been associated with impaired glucose tolerance and diabetes across diverse populations, and administration of vitamin D3 to deficient animals improves insulin secretion.17,24,25 In observational studies of hemodialysis patients, intravenous vitamin D was associated with 22 and 18% lower risks for death,18,19 similar to results that we observed in this nondialysis CKD population. A recent meta-analysis by Palmer et al.26 found greater risks for hypercalcemia and hyperphosphatemia in dialysis and nondialysis patients who were treated with activated vitamin D agents. That pooled analysis could not demonstrate a statistically significant treatment effect of vitamin D on serum PTH levels. It is difficult to extrapolate findings from that meta-analysis to this study, because previous studies of activated vitamin D in predialysis populations have generally focused on biochemical end points and lacked adequate follow-up to draw meaningful conclusions about potential clinical benefit or harm. Some convergence in survival estimates was noted in our study after 2 yr of follow-up for the combined outcome of death plus long-term dialysis. Two nonmutually exclusive possibilities may explain this finding. First, the number of participants available for analysis after 2 yr was small. Second, crossover during follow-up may have led to progressive misclassification of calcitriol status over time. The primary limitation of this observational study is the potential for confounding by indication, in which calcitriol users may have differed from nonusers in terms of health status and behaviors. A number of techniques were used to address possible confounding by indication. First, the study population was restricted to individuals with an indication for oral calcitriol, defined by CKD, hyperparathyroidism, and no recent hypercalcemia. Second, matching was used to attenuate potential differences in age, kidney function, and time from first detectable calcitriol indication. Third, adjustment for other medications that are frequently prescribed in CKD addressed the possibility that calcitriol may indicate greater general use of other important medications. Fourth, adjustment for comorbidity, clinic visits, and laboratory results was used to account for potential differences in health status between exposure groups. Despite these approaches, differences in unmeasured characteristics could have led to biased results. A second limitation is the relative paucity of clinical serum PTH measurements, reducing the available study population and hampering longitudinal assessment of hyperparathyroidism. Confounding by serum PTH levels seems unlikely because higher PTH levels found among calcitriol users were associated with a greater risk for death in this study. Still, diverse PTH assays used in different Veterans’ Affairs (VA) centers may have interfered with our ability to account fully for PTH. Confounding by socioeconomic status seems unlikely given generally equal access to care and medications within the VA system. Our study population generally consisted of older men with a high prevalence of diabetes and cardiovascular disease; therefore, results may not be applicable to younger, more diverse CKD populations. Our study focused on calcitriol because this medication is commonly prescribed in CKD and can be accurately ascertained from pharmacy records. Intake of less potent forms of vitamin D from diet, sun exposure, and nonprescription medication use is more challenging to measure. These forms of vitamin D may also have important potential health benefits in CKD via interaction with both renal and nonrenal 1-α hydroxylase.27 Such effects may be particularly important in populations in which vitamin D deficiency is endemic, such as the Pacific Northwest. This intriguing hypothesis should be tested in settings where nonactivated vitamin D intake can be accurately assessed. In summary, we observed lower risks for death and death plus dialysis dependence associated with oral calcitriol use in patients with stages 3 to 4 CKD. Although confounding by indication cannot be excluded, observed associations remained reasonably strong after adjustment for comorbidity, kidney function, and serum PTH levels. These data are among the first to show oral calcitriol use in relation to clinical outcomes in patients with CKD and add to a growing body of observational data linking vitamin D use with improved survival. Randomized trials represent the next appropriate step for evaluating the health consequences of vitamin D.
Data were abstracted from the Northwest VA Consumer Health Information and Performance Sets (CHIPS) database, which acquires data directly from the computerized VA medical record system. CHIPS includes demographics, pharmacy records, diagnosis and procedure codes, laboratory values, and vital signs for all inpatient and outpatient visits to the Veterans Integrated Service Network (VISN 20), a collection of eight VA facilities in Washington State, Idaho, Oregon, and Alaska. We used a matched cohort design to evaluate associations of oral calcitriol use with mortality and dialysis dependence. We studied incident calcitriol use to capture fully outcomes that may occur after drug initiation. Other oral activated vitamin D agents were rarely prescribed within the Northwest VA network and therefore were not evaluated. Incident calcitriol users were selected on the basis of (1) a first oral calcitriol prescription between 1999 and 2007; (2) stage 3 or 4 CKD, defined by two outpatient eGFR measurements between 15 and 60 ml/min per 1.73 m2 at least 3 mo apart, with the latest eGFR measurement within 1 yr before first calcitriol use; and (3) hyperparathyroidism, defined by a serum PTH level >70 pg/ml within 1 yr before first calcitriol use. The four-variable Modification of Diet in Renal Disease (MDRD) equation was used to estimate GFR.28 Incident calcitriol users were further required to have an outpatient nephrology clinic visit within the previous year. Calcitriol users were excluded for long-term dialysis, kidney transplantation, or recent hypercalcemia, defined by an uncorrected serum calcium level >10.2 mg/dl within 1 yr before first calcitriol use. Incident calcitriol users were matched with control patients who met the same inclusion criteria as calcitriol users: Stages 3 to 4 CKD; hyperparathyroidism; an outpatient nephrology clinic visit within the previous year; and no history of dialysis, transplantation, or recent hypercalcemia. Under this approach, a calcitriol user could match as a control subject when he was a suitable match and had not yet initiated calcitriol. Such patients represent control subjects who crossed over to calcitriol after the study start. This approach avoids potential bias that can occur by matching all exposed patients up front, thereby necessitating that control subjects will never start therapy during follow-up. Control patients were individually matched to calcitriol users by age (±5 yr) and eGFR (±5 ml/min per 1.73 m2) and were further matched by the time from their first identified indication for oral calcitriol, defined by initial detectable onset of CKD, hyperparathyroidism, and no recent hypercalcemia. Additional matching by time from calcitriol indication was used to control for potential differences in disease duration between exposure groups. Up to three control patients were selected per calcitriol user. Computerized pharmacy records were examined to identify the fill date, dosage, and number of pills prescribed for each oral calcitriol prescription. The first fill date for oral calcitriol defined the beginning of follow-up for calcitriol users and matched control subjects. Calcitriol adherence was calculated as the number of days with an active calcitriol prescription (defined as not more than 90 d between refills) divided by the number of follow-up days. Starting calcitriol dosage was 0.25 μg/d for 55% of study participants; the remainder initiated therapy using <0.25 μg/d, most often 0.25 μg three times per week. We analyzed baseline calcitriol dosage as 0.25 versus <0.25 μg/d. The primary study outcomes were mortality and the combined end point of mortality plus long-term dialysis. Secondary outcomes were hypercalcemia, defined by the first uncorrected total serum calcium measurement (inpatient or outpatient) >10.2 mg/dl, and changes in serum calcium, phosphate, and PTH levels during follow-up. The VA maintains date-of-death information for all enrolled veterans. Information regarding cause of death is not available through the electronic medical record system; therefore, cardiovascular-specific death could not be evaluated. Long-term dialysis was identified by an outpatient visit to a VA dialysis unit, a VA administrative code for long-term dialysis, or an outpatient V-code that indicated long-term dialysis. This combination of coding sources had a sensitivity and specificity of 93 and 94%, respectively, for identifying long-term dialysis, defined by linking a subset of records to the US Renal Database System for patients who entered the CHIPS cohort before 2003. Follow-up outpatient PTH and calcium measurements were ascertained from the laboratory database among noncensored individuals. We evaluated intraindividual changes in serum mineral metabolism markers during follow-up, rather than mean levels, to avoid potential differences that might occur as a result of changes in the study population over time as a result of death. Prevalent medical conditions were defined by examining all available diagnosis and procedure codes before the study start date. Diabetes was defined by either two outpatient or one inpatient International Classification of Diseases, Ninth Revision, Clinical Modification code for diabetes or a filled prescription for insulin, glucose test strips, a glucometer, or oral hypoglycemic medication. Coronary heart disease was defined by a diagnosis code for ischemic heart disease or procedure code for coronary angioplasty or coronary artery bypass grafting. The Charlson comorbidity index, which differentially weighs 17 diagnostic categories to create a continuous comorbidity score,29 was calculated using hospitalization data from the year before the start date. Baseline medication use was defined by a fill date plus days’ supply that was within 90 d of the study start date. Outpatient vital signs were time averaged during the year before the study start date. VA sites were considered to be metropolitan (Seattle or Portland) versus rural (Boise, Anchorage, Roseburg, Walla Walla, Spokane, and White City). Means and proportions of baseline characteristics were tabulated with respect to incident calcitriol use. Patients were considered to be at risk until they incurred a study outcome or their data were censored as a result of loss to follow-up or study completion on July 31, 2007, whichever came first. Loss to follow-up was defined as 18 consecutive months without a VA contact in the absence of death. Mortality analyses counted all deaths that occurred after the study start date, without censoring for dialysis. Unadjusted event rates were calculated as the number of events divided by person time at risk, weighted by the inverse of the number of individuals in each matched group for control patients. CI for event rates were calculated using the Fisher/van Belle approximation.30 Cumulative incident rates for each outcome were plotted using the Kaplan-Meier method for censored data. Cox proportional hazards models with robust SE were used to estimate the association of calcitriol with each study outcome after adjustment for potential confounding variables. Covariates that might be related to calcitriol use and mortality were selected a priori and then added in blocks to nested models. For best approximation of the intention-to-treat approach of a clinical trial, patients were analyzed according to their baseline calcitriol treatment status. A sensitivity analysis was also conducted using an “as-treated” approach, in which noncalcitriol users were censored on the date of first oral calcitriol use. Mean differences between baseline and follow-up laboratory variables were calculated at 6 mo, 1 yr, and 2 yr after study start date for study patients with available follow-up measurements. The closest outpatient measurement to each time point was used, and values were treated as missing when there was no measurement within a 3-mo window on either side. Race was administratively missing for 29% of the study population. Missing race values were handled by creation of a missing race category; sensitivity analyses revealed nearly identical results using an imputed race model (data not shown). Data were analyzed using Stata 9.2 and R 2.5.1. B.K. has received consulting fees from Abbott and Shire and grant support from Amgen. This study was supported by National Institutes of Health Career Development Award K23 DK63274-01. See related editorial, “Active Vitamin D and Survival,” on pages 1442–1443. Low Calcidiol Levels and Coronary Artery Calcification: True, True, and Related?